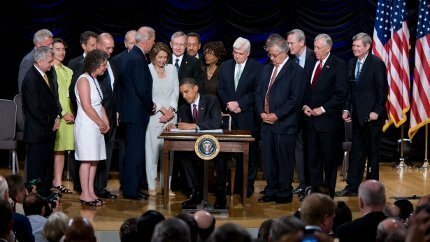 President Obama today signed legislation that he said represents "the strongest consumer financial protections in history" -- the Dodd-Frank Wall Street Reform and Consumer Protection Act, which squeaked to Senate passage with the votes of three Republicans who defied their party's leaders. Supporters fought for months to pass the legislation that they say will protect consumers from hidden fees and investment scams and require the financial industry to provide clear information so consumers can make the best financial decisions. Obama echoed those claims in his remarks as he signed the measure at the Ronald Reagan Building in Washington. "These protections will be enforced by a new consumer watchdog with just one job: looking out for people - not big banks, not lenders, not investment houses - looking out for people as they interact with the financial system," he said. "If youve ever applied for a credit card, a student loan, or a mortgage, you know the feeling of signing your name to pages of barely understandable fine print. What often happens as a result is that many Americans are caught by hidden fees and penalties, or saddled with loans they cant afford," Obama said. Obama added: "With this law, well crack down on abusive practices in the mortgage industry. Well make sure that contracts are simpler - putting an end to many hidden penalties and fees in complex mortgages - so folks know what theyre signing. "With this law, students who take out college loans will be provided clear and concise information about their obligations. "And with this law, ordinary investors - like seniors and folks saving for retirement - will be able to receive more information about the costs and risks of mutual funds and other investment products, so that they can make better financial decisions as to what will work for them. " With an eye on the upcoming midterm elections, Republicans -- who had almost unanimously opposed the measure -- said that the government's attempt to more closely regulate banks and Wall Street would lead to more bailouts, not fewer. Republican Rep. Mike Pence of Indiana echoed last week's call by Minority Leader John Boehner (R-Ohio) to repeal the measure. "This financial-services reform is nothing more than a permanent bailout of Wall Street that will restrict credit, kill jobs, raise taxes and expand government control of the private sector," Pence said. Obama returned the favor, calling the Republicans "a partisan minority determined to block change." The measure establishes a first-of-its-kind regulator, whose sole job will be consumer financial protection -- cracking down on abusive lending and financial practices including mortgages, credit cards, payday loans and bank accounts. Mortgage reforms include requirements that borrowers provide evidence of their ability to repay mortgages, and prohibitions on compensating lenders for steering consumers into higher-cost loans. For consumers who are also investors, it seeks to ensure accountable, transparent derivatives trading: Nearly all derivatives will have to be exchange traded and cleared, so trades have enough money backing them and regulators can spot problems before they threaten the entire economy. Commercial banks will be prohibited from trading in some of the riskiest swaps. Supporters say it will strengthen reform by closing the loophole to ban all swaps trading by taxpayer-backed commercial banks. It adopts the so-called "Volcker Rule," named for the former Federal Reserve chairman who proposed it, It limits banks' ability to speculate with taxpayer-insured deposits, and prohibits financial companies from betting against their clients. Supporters say it closes the loophole to ban all speculation with taxpayer-backed funds. It begins to tackle "too-big-to-fail," creating a new system to break up, rather than bail out, failing financial firms and make banks pay the bill. It will set strict size and leverage limits, and rebuild the walls between investment and commercial banks. Thanks to furious lobbying efforts by car dealers, who portrayed themselves as "Main Street" rather than Wall Street, the consumer protection measure does not specifically tighten the clamps on car dealers but the new consumer watchdog agency will have jurisdiction over loans made by auto finance companies such as Ford Motor Credit and Ally Financial, formerly GMAC. Consumer advocates had wanted individual car dealers to be brought under the new regulator's supervision, noting that dealers originate about $250 billion in car loans each year. But dealers and White House officials said the bill will ride herd on dealers by regulating the auto industry's lending arms. "The auto dealer lenders will have a hard time competing with really very high fees or practices against" loans made by banks and auto lenders that will be subject to new oversight, Diana Farrell, deputy director of the White House National Economic Council, told The Detroit News. The Federal Trade Commission (FTC) also gets expanded authority over dealer lending practices. "The newly created Bureau of Consumer Financial Protection will have direct federal oversight over all auto loans and those that underwrite, fund or service auto loans, such as banks, credit unions, finance companies and 'buy here-pay here' operations at dealerships," Ed Tonkin, chairman of the National Automobile Dealers Association, said comments published today by Automotive News, a trade journal. One unsavory slice of the financial services industry that will come under federal regulation for the first time is payday lenders -- the ubiquitous storefront and online lenders who loan small amounts of money at exorbitant short-term interest rates, making it nearly impossible for financially-struggling consumers to pay off their initial loan. The new Consumer Financial Protection Agency (CFPA) is expected to enact caps on the interest rates that can be charged for short-term loans. Payday lenders claim they provide a valuable service by loaning money to consumers who would otherwise not be able to get credit, but it's hard to find impartial observers -- or clients -- who go along with that claim. "I have paid these people so much money you would not believe," Sandra, of Fuquay Varina, N.C., wrote in a complaint about OneClickCash.com to ConsumerAffairs.com. "I think a law should be made to do away with these companies." State governments have also been cracking down on payday lenders. "This bill sets the wheels in motion to replace the failed deregulatory policies of the 1990s with real oversight of Wall Street," said Carmen Balber, Washington Director for Consumer Watchdog. AARP said it supports the legislation because it will establish a watchdog that will protect consumers from getting a mortgage or credit card that has hidden fees that cause their bills to skyrocket; ensure Americans get the clear, accurate information they need to shop for mortgages, credit cards and other financial products; and crack down on investment scams targeted at older Americans. "Over the last three years, older Americans have lost billions of hard earned dollars due to the failure of an outdated and compromised financial regulatory system," said AARP Maryland senior state director Rawle Andrews. "The failures that led to this crisis require bold action to restore responsibility, accountability and consumer confidence in our financial system, and this bill will protect Americans' money and help stabilize our entire economy." Heather McGhee, Director of Demos' Washington DC office who supported efforts to pass the bill, said the reform will help middle class consumers. "After the new consumer regulator opens its doors, Americans will open a checking account or apply for a loan with greater security because their lender will be accountable to basic standards of fairness and transparency," McGhee said. "Investors will know that their broker-dealers are acting in their interest. Businesses hedging risk will know the real price of the derivatives contracts they buy. And if we have truly independent regulators with the will to stop reckless speculation, those regulators will have the power and tools to do so." Michael D. Calhoun, president of the Center for Responsible Lending, also hailed Senate passage of the law, saying will help end a nightmare for many American families. "People will get loans they can afford to repay, and principles of fairness and value in financial products will trump easy money and self-enrichment," Calhoun said. "The new regulatory framework will go far to reduce risky practices and restore common-sense in financial services."